Ari grew up in suburban MA playing sports year round. He was introduced to strength training in junior highschool by the varsity football coach, and the rest is history! Training continued and progressed throughout his teen years, finally earning him a football scholarship to Springfield College where he pursued a degree in applied exercise science. 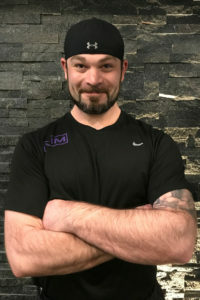 Ari has experience working in a variety of fitness settings, from collegiate weight rooms, to corporate fitness centers, private training facilities, sports performance facilities, and rehabilitation. He has trained everyone from 7 year olds, to clients in their 90’s! Successful clients include everything from athletes, to Olympic lifters, powerlifters, figure competitors, runners, weight loss, paraplegics, kettlebell sport, and anybody looking to learn more about fitness and training! Ari is adamant that proper technique is necessary for a safe and effective exercise program, and establishing movement patterns from the start enables the client to build a strong foundation. He has extensive work training clients with various injuries, and can help you eliminate your lower back, hip, and knee pain! No matter where your goals, are can help you get maximal results from your exercise program. Contact Ari today to schedule your complimentary fitness assessment!